I retired from the Australian regular army, Royal Australian Engineers on 1 June 2016, after serving some of 30 years with the Australian army both in a Reserve and Regular Army capacity, I separated from the Australian Defence Force on medical grounds, suffering PTSD with anxiety and depression. My condition made it difficult for me to leave the house for minor tasks like going to the shops, joining any hobby groups and I would have to avoid areas where a large amount of people would congregate. When shopping, I would always watch my back all while being hypervigilant to my surroundings. At times, I would have to cease shopping and leave the venue, this situation unfortunately would also cause road rage when driving a vehicle in heavy traffic, and my anxiety would reach a painful point. Through my psychologist, I was made aware of Service Assistance Dogs for people who are in similar circumstances. 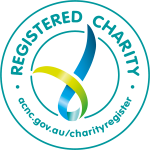 I proceeded to investigate the availability of a service dog for myself and I found various organisations on the Internet who offered this service. Unfortunately, with the high demand for veteran assistance dogs, this process became a laborious task of contacting these organisations keeping up to date when the assistance dogs would be available. 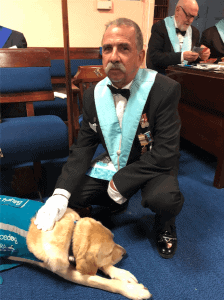 I was finally able to obtain an assistance dog through, Integra Service Dogs Australia, a not-for-profit organisation which provides assistance dogs for veterans having difficulty coping with the civilian environment. Integra Service Dogs Australia has developed a partnership with seeing eye dogs Victoria whereby if for various reasons the dog trained for visually impaired people become unsuitable to fulfil their role as a seeing eye dog, they may be passed on to Integra Service Dogs Australia and given to a Veteran in need. 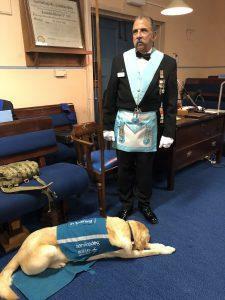 Norris has made a big difference to my lifestyle as I am now able to, with some confidence, go shopping, become part of hobby groups and of course Bring Norris along to my Lodge meetings. Freemasons Victoria makes good men better, and I can say that Norris is now making a good man even better. Norris and I still have a journey to take together in regards to our training program so as we can work together as a team. This is not limited to passing the Public Access Test (PAT) but more importantly, become my mate and comfort me in times of suffering. This training is being carried out with the excellent training assistance of Emelia Wilmot.